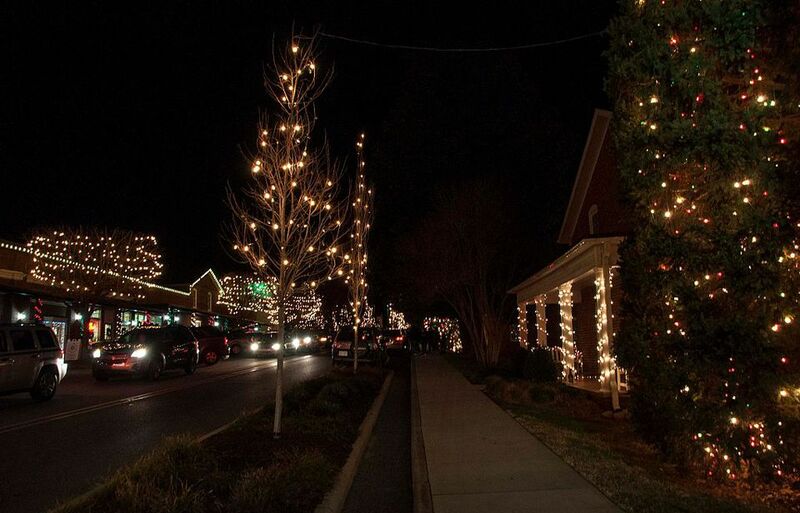 The town of McAdenville, North Carolina is named "Christmas Town USA," and with good reason. Each winter, the small town of fewer than 700 residents comes alive with a fantastic light display that draws in over 600,000 visitors annually. Located about 15 miles west of Charlotte, this tiny town full of the Christmas spirit, has provided a place where the over-the-top lighting tradition has taken place for over 50 years. The town of McAdenville itself puts up over 500,000 lights, and the majority of residents decorate their houses to an extravagant degree as well. McAdenville has gained plenty of national recognition, with Time Magazine and Southern Living Magazine counting it among the top10 holiday destinations in the nation. Good Morning America has broadcast live from the town, as have countless local news stations. It all began with a group of men who worked at the textile mill and their upcycled Christmas craft project. They took some discarded pipe from the mill yard, made a sign saying "Merry Christmas," wrapped it in lights and mounted it on the hillside above McAdenville. The story goes that the owner of the mill, William J. Pharr, was thrilled with their work and offered to pay the guys for more decorations. And, it spread across the town with Pharr's company helping with expenses. And the people started coming. Since the entire town makes up the light display, there is no charge to see the lights. You're just driving through a public city, a city filled with the glow of Christmas. The lights will begin glowing every single night usually starting on November 30, 2018. They usually glow until the night after Christmas. The hours for Christmas Town USA are Monday to Friday, 5:30 to 9:30 p.m., Saturday and Sunday: 5:30 to 11 p.m.
On the first day, they have a lighting ceremony starting at 5:00 p.m. and that night the lights come on at 6:00 p.m. It's usually held on a Saturday but since the school children are involved, the town decided to hold the festivities on a day when school was in session. You can join in on the festivities on the town plaza in front of the Pharr Family YMCA. To get to the town, just head to exit 22 off I-85 and follow the signs (or, the line of cars). Many locals though, go the "back way," Wilkinson/Franklin Boulevard (U.S. 29/74.) Taking this entrance will probably be less busy, and you'll see the same lights - just in reverse order. Friday and Saturday nights from 5 to 10 p.m. you will see the most traffic, so expect backups on both I-85 and Wilkinson Boulevard. Be sure to take one of these routes, because if you plug "McAdenville" into your GPS or a mapping service, it will most likely take you to the actual McAdenville exit on I-85, which will be closed. Of course, if you're even in the vicinity on the Interstate or 29/74, you won't miss the town or signs. There's only one route through town, so you can't miss anything. If you start at I-85, it will take you to 29/74. Starting at 29/74 will take you to I-85. Many locals believe that walking through town is the best way to experience the city and make a family tradition out of the walk. If that's your plan, your best bet will be to park in one of three lots recommended by the town. A parking lot is located behind the McAdenville Baptist Church/Caromont Clinic, another lot is located behind the Village Restaurant on Main Street, and there's a large parking lot is located beside the lake in the heart of Christmas Town. Many people also park in the shopping center parking lot that's on your left as you come in on 29/74 (from Charlotte). The route is approximately 2 miles long from start to finish ​and should take you 30 to 45 minutes to drive on a weekend (weeknights will be less). Vehicles do move slowly, and it's considered courtesy to turn off your lights (you won't need them anyway, even at night). The Christmas Town USA website has all you need to know (and more) about enjoying the lights and the festivities in McAdenville. The town of McAdenville actually does allow for hayrides, but only if the vehicle being pulled is pulled by a motor vehicle. No animals are permitted to pull a hayride through the town. Dogs, of course, are permitted if you're just walking through the town.